The indoor air quality is worse than the outdoor air, even in the most industrialised cities. Is indoor air pollution really higher than outdoor air pollution? Are there ways to measure it? As an environmental chemist, I can honestly tell you that most people don't realize just how bad their indoor air quality is, since they don't realize just how many items in their home are contributing to it. With regards to measuring indoor air quality, the US National Ambient Air Quality Standards can be found here, and the EPA has a publication database on Indoor Air Quality (IAQ) available here. There are a number of devices used to sample the indoor air periodically which calculate the total amount of chemical/PM present over a given amount of time. Regional differences aside, there are a few 'standard' pollutants found in pretty much all homes: particulate matter (PM), passive smoke, formaldehyde and other VOC's, air fresheners/cleaners (seriously). It's also worth mentioning heating sources: fireplaces, wood burning stoves, gas stoves, furnaces and the like; if they're not functioning and/or used properly then they can emit pollutants indoors - notably NO2 and SO2. Home ventilation plays a key role in indoor air quality: if your home isn't well ventilated, then the pollutants are able to accumulate in the ambient air to levels which can trigger a response in the people living there - asthma, headaches, etc. Also, the quality of the materials used in the home can contribute to the quality of the indoor air, as well as its age. Bernstein, et al (2008) published "The health effects of nonindustrial indoor air pollution" in the Journal of Allergy and Clinical Immunology (121:3) - it's a pay site, but I have access to it, and I'll give a brief overview of their findings below. Acute exposure to O3 produces decrements in pulmonary function and exercise capacity and induces airways inflammation in both healthy individuals and those with pre-existing airways disease (ie, asthma, chronic obstructive pulmonary disease). Main sources of indoor O3 are from outdoor O3 resources as well as air purifiers (electrostatic precipitators, negative ion generators, and ozone generators), which are marketed to the public to provide relief from numerous respiratory ailments as well as to reduce odors and destroy microbes. These devices have been shown to increase indoor O3 concentrations in the range of 16 to 453 ppb. As a sidenote, the 8 hour max ozone exposure is 750 ppb. Because more than half of all households in the United States use gas, the primary source of indoor NO2 is gas-fueled cooking and heating appliances. An extensive literature has examined the link between NO2 exposure and duration causing adverse respiratory effects in susceptible populations, but results are inconclusive. There is recent good evidence suggesting that children with atopy or asthma, infants who are at risk of developing asthma, and female adults are more sensitive to the respiratory effects of NO2 exposure. Indoor NO2 exposure may also enhance asthmatic reactions to inhaled allergens. In the United States, elevated indoor NO2 levels are more prevalent in lower-income housing developments because of poor ventilation, small apartment size, and frequent use of gas stoves for supplemental heating. Nitrous acid, a product of primary combustion formed as a secondary product of NO2 and other nitrogen oxides and water, is also found on indoor surfaces. Nitrous oxides acidic nature makes it capable of causing respiratory damage leading to respiratory symptoms in patients with asthma at concentrations of 650 ppb over 3 hours. Carbon monoxide is a tasteless, odorless, colorless, and nonirritating gas produced by incomplete combustion of organic material and is the leading cause of poisoning in the United States. The main sources of indoor CO are gas appliances, unvented kerosene heaters, and environmental tobacco smoke (ETS). The main health effect of CO is a result of its ability to impair the oxygen binding capacity of hemoglobin, which can cause headaches, nausea, dizziness, breathlessness, and fatigue, and with high exposures can lead to coma and death. The severity of CO poisoning is dependent on concentration, length of exposure, and the general underlying health status of the exposed individual. Because carboxy-hemoglobin concentrations in blood are cumulative over time, prolonged exposure to low concentrations can result in considerable health effects. Burnett et al found that CO, compared with the other major indoor gaseous pollutants, NO2, SO2, and O3, was the strongest predictor of elderly patients being hospitalized for congestive heart failure. You mention VOC being more of an office building problem, but that's actually not at all true. 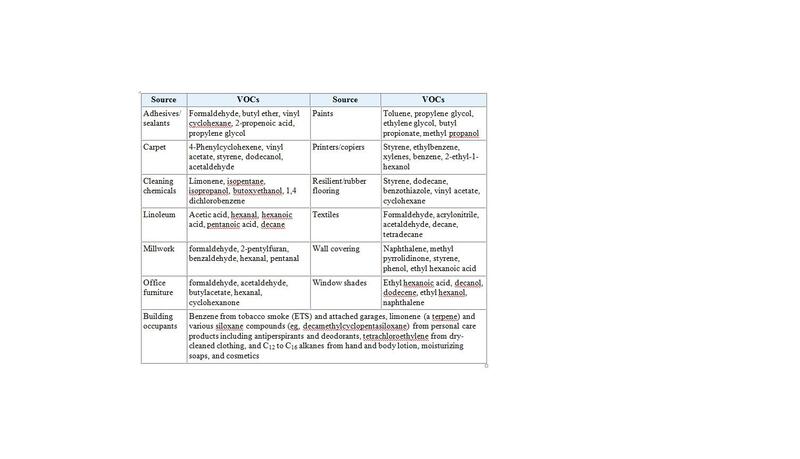 There are PLENTY of sources for VOCs in a home - again, you just don't think of them as a 'source' of VOCs. The above table lists what chemicals are emitted by indoor items, I've taken the time to give a small summary of where you'll find them in your home. Please note that my list is by no means exhaustive of the sources. Adhesives: furniture, wood floorings, moldings - anything that's been glued in your house. Particleboard also is smothered in adhesive. Carpeting: it's treated to resist stains and smells - it's often glued and nailed down. Cleaners: If you're using a cleaner that should be diluted - and don't dilute it properly - then you'll be left with a residue that contributes to the PM pollution in your home. Linoleum - again, glued down. Millwork: all that lovely molding, window casings, baseboards and doors - yep. It's contributing. Office furniture: again, particle board, glues and all. Most homes have at least 1 computer and a computer desk/hutch. Paints: If your walls aren't painted, then they're most likely wallpapered. Either way - they both emit VOC's. Others: any spray (air fresheners, deodorants), tobacco smoke, CO & benzene from your attached garage, etc. Textiles: ALL textiles are treated for shipping - do you wash your drapes before you hang them? What about the pillows on your sofa and the cushions? Now to answer your question, "is indoor air pollution really higher than outdoor air pollution?" The air inside your house comes from the outdoor environment (and the amount present in the outdoor air will vary daily) - therefore any pollutants that were present in the outdoor air are now present in your home. The ventilation rate was also continuously monitored. Indoor particle concentrations were observed to vary from 500 to 104 cm−3 with a high dependence on the outdoor concentrations. This indicates that in this scenario, indoor particles are mainly of outdoor origin. Effects of ventilation rates on indoor air particle concentrations and several inorganic gases were studied. We found that ventilation had a strong influence on indoor particle and gas concentrations. I/O (indoor/outdoor) ratio in different in different particle size classes. Again - the ventilation of the home is the major mediator of pollution levels. Not the answer you're looking for? Browse other questions tagged environment chemistry . Is paying your bill online more environmentally friendly than post?